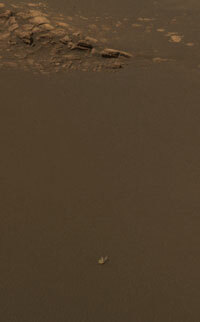 First look at "bunny ears" in Opportunity's mission success panorama. This movie of the "bunny ears," compiled from three panoramic camera images taken about two minutes apart, indicates that the object can move in a light wind. 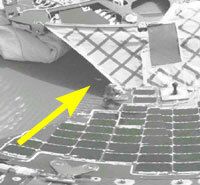 The Mars Pathfinder mission set a precedent in 1997 for puzzling pieces around the landing site. An object dubbed "Pinky" caught the attention of the Pathfinder science team and the public. Although never positively identified, it was thought to be a piece of Kapton tape – an adhesive used often in aerospace applications. Rover scientist Jeff Johnson traced the "bunny ears" to under the north-facing egress ramp. To further complicate the Meridiani mystery, when Johnson tried to image the quirky "ears" at higher resolution, they had vanished from where they were originally spotted – about 4.5 meters (15 feet) from the lander. 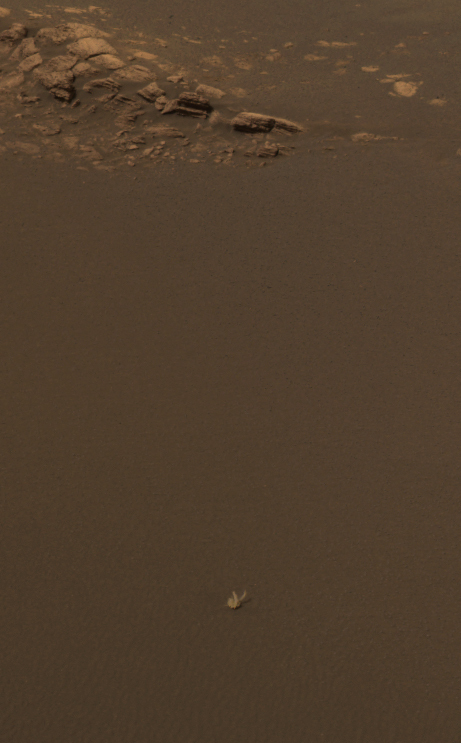 Johnson, intrigued by their disappearance, was good-naturedly assigned by Steve Squyres (the mission's principal investigator) to "track the bunny." He discovered that the object was visible in navigation camera images acquired on landing day – but lying a meter (about 3 feet) further from the lander, up the crater slope. Using JPL-designed software, scientists are able to measure the "bunny ears" in each image where they appear. The object is about the same size in every image. "There's no evidence of a mark that it left in the soil as it moved," Johnson noted. "It was light enough and small enough to not leave any ‘footprints'." "Our team believes that this odd-looking feature is a piece of soft material that definitely came from our vehicle," said Rob Manning, lead engineer for entry, descent and landing. "We cannot say exactly where it came from but we can say that there are several possibilities: cotton insulation, Vectran covers and wraps from the airbag,Zylon bridle tensioning ties, or felt insulation from the gas generators.... The list goes on. We do not think this is parachute material, however, due to its color (it does not look blue enough to be the undyed nylon or red enough to be the dyed nylon).